Patate Mallette isn't some simple roadside eatery you happen to stop at when you want a snack. Patate Mallette is the destination. It's small, but the Beauharnois eatery has gained a reputation for slinging some of the best poutine in the province, a reputation held since it opened in 1956. Just make sure to only head here during the warmer months, as it closes up shop during the winter. The small town of Lachute may not be much of a tourist destination, but plenty of Montrealers head to the little hamlet solely for the poutines at Restaurant Labelle. 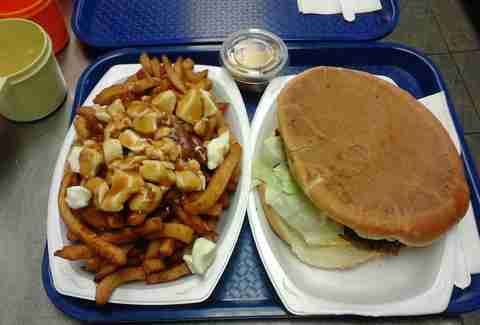 Affectionately referred to as “Labelles” by folks who know and love the small truck-stop-esque eatery, the poutines served here achieve a near-perfect ratio of cheese, fries, and gravy, in portions that aren't too big nor too small. 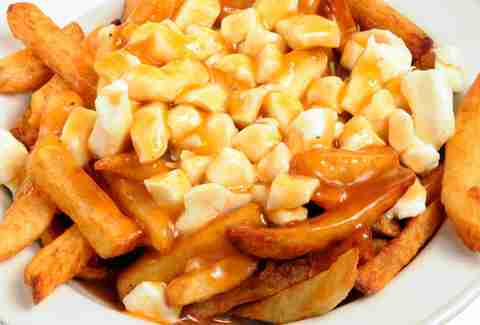 Poutine lore asserts that Le Roy Jucep may be the original birthplace of the cheese/potato/gravy dish, and while the jury is still out on that claim, the diner lives up to the legend with arguably the best poutine in the province. Its signature sauce/gravy may be a bit sweeter than you'd expect, but that's actually what poutine aficionados love about the place. 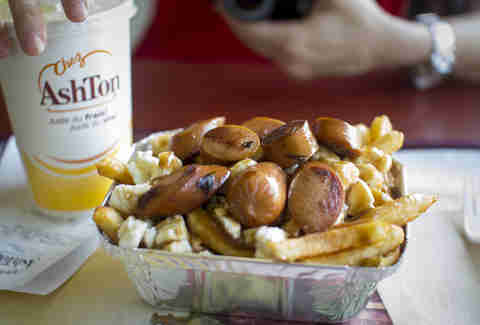 For no-frills poutine in Quebec City that is straight-up tasty, Chez Ashton is the place to go. You can't go wrong with the classic poutine, but anyone who wants to kick it up a notch should definitely go with the spicy sauce, which you can get on any kind of poutine. For another added touch, throw on some sausages too. Quebec City's answer to Shake Shack does things a tad bit differently. Instead of using standard French fries, Le Chic Shack's “poutine classique” includes smashed baby potatoes, which does add a little something extra to the dish. Vegetarians will also be pleased to hear Le Chic Shack has a veggie poutine just for them, topped with a mushroom gravy and big ol' chunks of cheese curds that make up for the lack of meat. 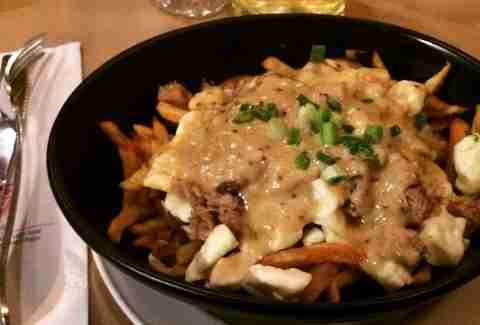 Quebec City's winner of Poutine Week 2015, La Souche is one bar whose food may be even better than the drinks. Even though you can't get the winning poutine all year round, the rest of La Souche's poutines are just as good; all topped with a homemade beer gravy, using its home-brewed suds. Having more cheese on anything is always a good idea, and that's what sets Casse-Croûte Du Vieux-Moulin apart from other poutineries -- the epic amount of curds on every single poutine. Made melty with a tangy BBQ-sauce-like gravy, every dish from Casse-Croûte Du Vieux-Moulin has a more-than-modest cup and a half of cheese curds. 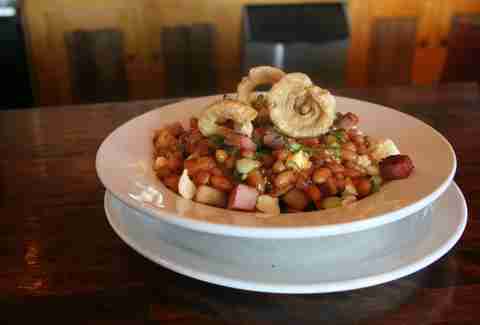 Another roadside eatery that can't be ignored, Flashbourg offers up a no-frills poutine that is everything the dish should be. The poutine is served by some of the friendliest staff you'll ever meet, and your entire being will be filled by the good vibes that only poutine and genuinely nice people can provide. When a poutinerie is open 24 hours, you know there has to be something about it that keeps folks clamoring back at any and all times of day. At Restaurant Henri, which began as a humble food trailer in 1957, it's the legendary fries that have poutine lovers hooked. Made in-house and perfectly greasy, Restaurant Henri's famous fries are taken to the zenith of indulgence when soaked in gravy and cheese curds, creating a near-perfect poutine. 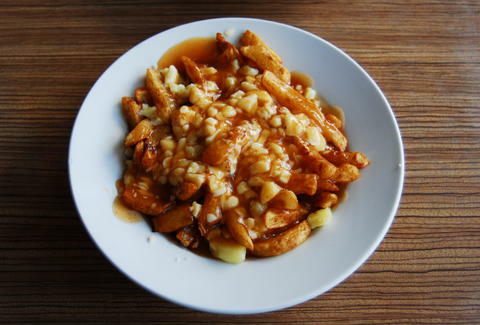 Poutine purists may scoff at the idea of “fancy poutines" that branch off from the holy fries-cheese-gravy trinity and incorporate other toppings/flavours, but one bite of La Lapin Saute's poutine will surely shut them up. Here, fries and cheese curds are topped with a creamy gravy with chunks of rabbit meat, making for a full-bodied flavour and a broadened culinary horizon. Chez Ben (as it's known to locals) rocks a classic fast-food atmosphere unseen in many other modern eateries, but the poutine is what will have you coming back. 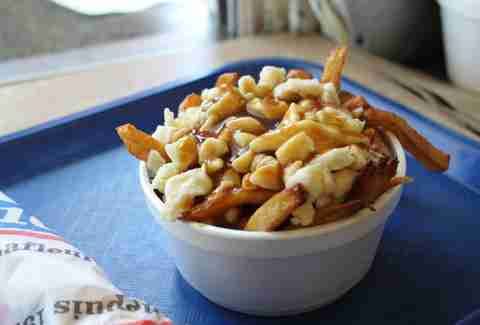 Filling, delicious, and highly addictive, the poutine here is the best for miles around.